I discussed our Sunshine Coast Centre with past president Bill Clark the other day, and he observed that on the 30th of June, 2004, ten people got together in a living room and started the Sunshine Coast Astronomy Club which subsequently became the Sunshine Coast Centre of the RASC in April 2008. Here we are 12 years later and they’re all still with us. We’d like to commend them all for their service to our club over the years. We are no longer the newest centre of the RASC: The Yukon Astronomical Society joined the RASC in May of this year. Nor are we the smallest. With 75 members, we’re a mid sized Centre now. The percentage of female members in the RASC is 18% now, which is 10% behind the percentage of females in STEM sciences nationally. I am pleased to report that the percentage of females in our Centre is now 25%, so we are setting the example for the rest of the RASC to follow. I would like to thank the members who took time out of their busy schedules to help us at outreach events and work parties this year. We log over 2200 hours of volunteer work at outreach events every year. As I pointed out last year, this figure is deceptive, as only a small group of members have put in all these hours. Some members seem reluctant to involve themselves in outreach as they don’t think they know enough about astronomy to face the public; we’re going to help members to give them the support to make them feel comfortable. We’re planning to have more member events this coming year. Past President Mike Bradley and I have published the SCC Observatory Operations Manual and put a link to it on the “Our Observatory” page of our web site. I encourage anyone who would like to use the observatory to download the manual and read it. Operating the observatory isn’t difficult and we encourage our members to use it. We started as a club with frequent members star parties, and we started to bring that back this year with members viewing nights and the Deep Sky Party at the end of July. This was the first time we held a star party for members of other centres. Members from the Vancouver and Victoria Centres attended and spent the weekend at the airport viewing the skies. The turnout for this event was small but the feedback was good. We hope that this event will expand in coming years. Last year we revived our Light Abatement efforts with presentations to community organizations. This year our light abatement committee has been lobbying the District of Sechelt to get it registered as a Dark Sky Community recognized by the International Dark Sky Association in the coming months. We replaced our web site in July 2014 with a WordPress site that allowed us to track activity. By the end of 2014 we had 4,626 views of our web site from 1,385 visitors. In 2015, 3,765 visitors made 12,102 views. So far this year we’ve had 8,534 views from 2,693 visitors from 66 countries and territories. That’s 25,262 visits from 8,113 people. Several youth organizations have complimented us on our web site. Our speaker’s program started in our early days has evolved into at least 8 nationally recognized experts doing presentations at our meetings every year. We still lead all the other RASC Centres in use of the national Public Speakers Program. Speakers for next year include Dr. Sun Kwok, Dr. Laura Ferraresse, Dr. Stanley Greenspoon, Leigh Cummings, and James Edgar. Members and the public have been asking for astronomical training, so we are now looking at developing something like Prince George Centre’s NOVA course to offer to our members. At the beginning of next year’s program we’ll start with a course on how to use the Observer’s Handbook. This last year was the first year we utilized an operational budget. We took a serious look at new ways to raise funds and approved our first gift acceptance policy. This policy will ensure that donations fit into our operational plan. Our Secretary, Brian Lucas, initiated a successful fund raising scheme: Reloadable IGA cards. These cards have been distributed both to members and to people attending our monthly talks. We get 4% of any purchases people make with these cards. The income from the first quarter was $381, and this is after the initial $100 for the cards was deducted. If the use of these cards stays at this level, this means that we’ll get nearly $2000 a year from this initiative. This year we entered into a partnership with the Sechelt branch of the Rotary Club which is called Friends of Rotary. Our Centre paid for a single membership which gives us the right to have a representative attend the Sechelt Rotary Club meetings. This gives us a voice in their organization and in turn they commit to raising funds to support our Centre, specifically to raise funds for our observatory expansion. We’ve been having regular meetings with Rotary and last Tuesday met with reps from various Sunshine Coast Rotary Clubs to finalize a grant request to fund additions to our observatory. 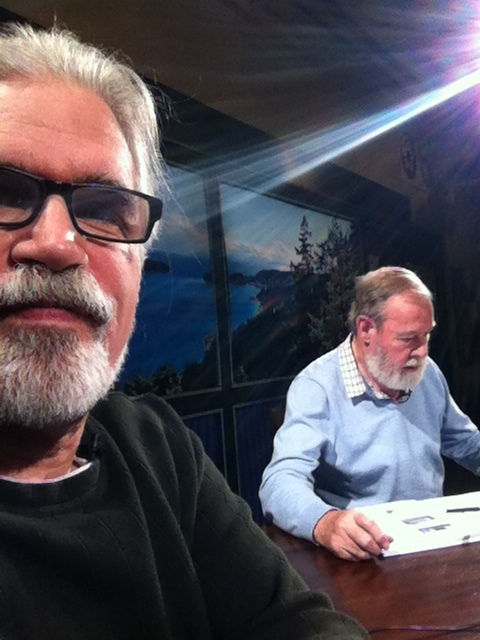 Our Night Lights TV program for Coast Cable taped its second season this year, and is in final production now. Last December word of this reached Telus Optik, who approached us to see about entering into a similar partnership. We met with Optik officials in January, and went on to make an application. We are now waiting for confirmation that we’ve been approved. In February we also made application to the Bravo Network to make a 15 minute BravoFACTUAL documentary. Bravo received 92 applications and approved 9: We were one of those approved. In August I spent two weeks on the road with a film crew taping for this show at the Prince George and Okanagan Centres, at the Dominion Radio Astrophysical Observatory south of Penticton, in Vancouver, and at our Centre., which is now in editing. It is to be completed and submitted to Bravo by the end of November. In the spring the Aboriginal Prime Time Network asked us to assist them in creating a new science show for First Nations youth, “Coyote Science”. Our members spent two days assisting APTN with this project at two Sunshine Coast locations. This past year was the first year of operations for our observatory. As expected, this year turned out to be a “shake down cruise” during which we familiarized ourselves with the telescope and equipment, identified and corrected problems, and identified needed equipment. We submitted a grant request to the BC Gaming Policy and Enforcement Branch seeking money for an optical package for the observatory. This year was the first time in 12 years that our Centre didn’t do an Astronomy in the Park event in Porpoise Bay Provincial Park. As I previously pointed out, we did not want to pay the excessive fee that Parks BC wanted for us to stage that event. Instead we held our first Starlight Coast Star Party at our observatory along with an astronomy poster contest for youth. This is a major change, since we’re switching from a captive audience of campers to drawing an audience of enthusiasts and curiosity seekers. Our first Starlight Coast Star Party attracted 85 people, which is the largest attendance at an observatory event all year. Although we reached a point at the end of June 2015 where our observatory became operational and continued to work on the building and its contents, it is not yet finished. We did install a roof retraction system, added solar panels to the electrical system, installed a protective cover and dew control system for our telescope and its sensitive electronics, and installed a ventilation system for the main optical tube. We installed the roof soffits and closed in the gap between the rails and the roof to keep the weather and wildlife out. We still do not have lighting in and around the observatory. Vents for an improved ventilation system for the building have been purchased and will hopefully be installed in the near future. Only three months after I first joined this centre in 2013 I put myself forward as a director at large and the following year I stepped up as president. Last April I became the National Public Speaker’s Program Administrator for the RASC. This year I became the National Secretary. Everyone in our Centre can help our Centre and the RASC in some way, whether it is by volunteering at outreach events, helping set up and take down at the monthly talks, serving on a committee, or serving on our board of directors. I’m not asking any of you to do anything I am not prepared to do myself. What we’ve accomplished so far happened because a small group of members donated some of their time, creativity, and ideas, making us one of the most active RASC Centres in Canada, even if we are nowhere near being the largest. We gained a director on our Centre’s board this year. Let’s see if we can gain another this year. This year my term as president is up, as is the treasurer’s term. I intend to stand for election and stay on for another two years. Mike Bradley, our Vice President, has another year left in his term, but would like to hand over the Observatory Director’s position to a new person. The election for directors will take place at the upcoming meeting on 14 October, so we hope that we’ll get a good turnout for the vote.